[21-Sep-2013 ] Hello, my name is Cookie. 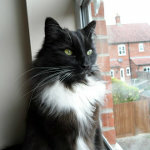 I am a 3 year old domestic long hair moggy. My human wouldn't type this up for me last night because he said he was tired. You just can't get the staff these days! I have been living at my forever home since November 2012 & as humans go, he's not that bad I suppose. I did spend a long time in a wooden pen with some foster humans waiting for one who could see my potential. All my friends who came to the shelter with me had gone & I was the last cat left in the pens as the human fosterers were giving up fostering. My previous human was a very kind lady, it was her who gave me my name. She found me in a hedge when I was a kitten. I was covered in some kind of glue because some people had been nasty to me. She took me in & I enjoyed living there for a year or so but there were too many other cats living there & she couldn't care for us all properly. I got fleas & most of my fur fell out so she gave me & my friends up to Cats Protection. It took a long time for my fur to grow back so no-one wanted me & I still looked pretty scruffy when my forever human saw me at the shelter. Human said he wanted an older female short hair cat but I rolled over & showed him my belly, complete with bald patch & he couldn't leave me behind. At my new home there was a pretty female cat. Queen Freya was a rescue cat too. We became friends but she got sick in the summer heat & went to the rainbow bridge. I have a new companion now but she doesn't like me much. Hopefully I can win her over with my charms. My favourite wet food is chicken in jelly, I am also partial to salmon in jelly. My real favourites are my Royal Canin crunchies. I like the anti hairball ones & the "digestive comfort" ones. My old companion Freya had a long term tummy problem so all the food in the house had to be of a certain type in case it made her sick. He felt guilty about restricting me food but little did he know, the digestive comfort food is my favourite. I don't like human food at all, not even roast chicken but I love crunchy cat treats of all kinds. Oh, spiders, moths & flies are an absolute delicacy! My favourite toys are my play tunnel, my catnip hedgehog & that red dot that lives inside a pen. I mainly like to play outside & chase bugs while the weather is nice but will come back to my indoor toys when it is cold. I like to sit with my human, sometimes I sit on him but not much. I like him to tickle my head & I purr very loudly & make a chirrup sound when I do. And I have a very quiet squeak of a meow & make lots of short meows as I come in through the catflap to let human know that I'm home. I also like to talk to the birds that nest above the windows here. No matter how much I try to persuade them, they never come to play with me! My favourite sleeping place is on top of the wardrobe but I do sometimes like to sleep on my human. I have to be brushed to keep me looking this handsome. I don't like it much but I sometimes let human do it because it seems to make him happy. I sometimes sit with my human & watch TV. Nature programs are my favourite. I like to be friendly with other humans but they scare me so I usually only talk to them if my human is around. About / Photo / Video: Copyright © 2013 Cookie, All rights reserved.